Description: An important watershed that supports the province of Sorsogon, the Mt. Bulusan Volcano National Park is also notable for being a center of biodiversity, being home to some near-threatened and vulnerable endemic bird species, as well as endemic flora. FPE’s involvement has helped mitigate excessively consumptive practices by promoting CBRM. An important watershed supplying the water needs of the provinve of Sorsogon. It is known for its hot and cold spring, geothermal fields and a small crater lake - Bulusan - glistening in the heart of a forest teeming with vines , wild orchids and giant ferns. 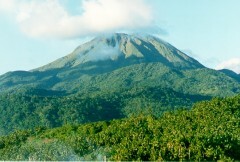 Bulusan Volcano's earliest recorded eruption was in 1852, followed by several eruption until 1916, emitting mud and ash and causing landslides. The volcano rested for 45 years from 1933. Its last recorded eruption was in 1983.